And I agree, that "fruitcake" was foul. I'll meet you in the kitchen then! If you really hate fruitcake, stop by my blog and vote in my poll. I have an option about what you can do with fruitcake that might tickle your funny bone. Yes, I would like to shoot it from a cannon. Thanks for stopping by! 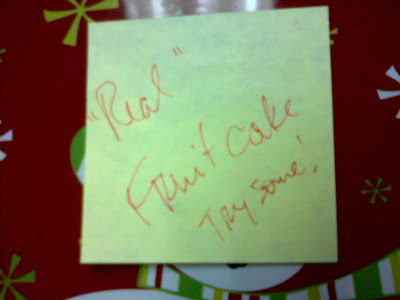 I don't care if it's real, "real," or fake, I'm not eating fruitcake. You can pass me some of that goatcheese, tho. Hahahah, I love that you have an entire page devoted to how evil it is.